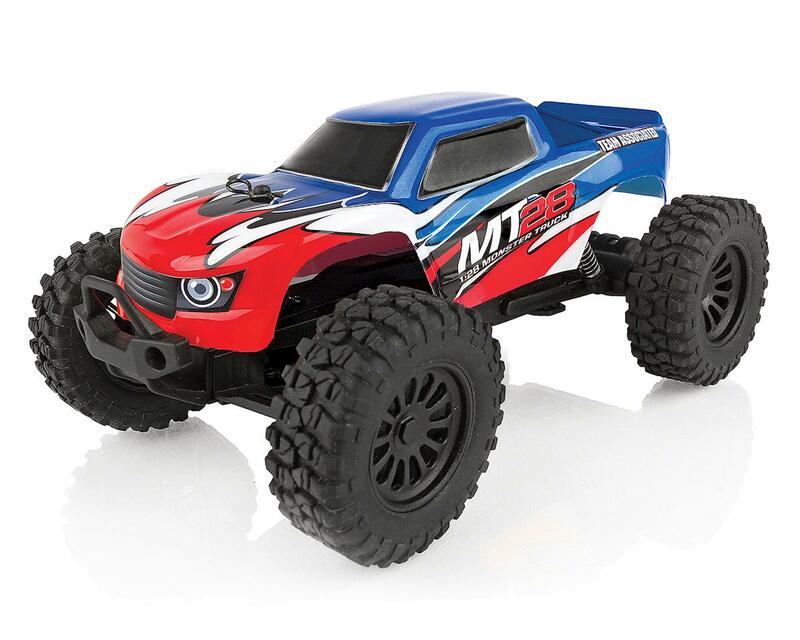 This Team Associated MT28 1/28 RTR 2WD Mini Electric Monster Truck is small in scale but monstrously fun! This no-nonsense pint-sized monster truck looks great with its eye-catching graphics and drives smooth thanks to its powerful electric motor and capable drivetrain. The included 2.4GHz transmitter gives you complete control through and over obstacles with ease! With the increased ground clearance and rubber tires, the MT28 handles like no other vehicle in its category. When your offroad thrills exhaust the vehicle's integrated battery, the convenient built-in transmitter charger makes it easy to get back to full power in less than an hour. A built-in rechargeable battery and 4 "AA" batteries are already included in the box! Just charge and drive! Nothing! Everything needed is included.